The Switchblade interchangeable paddle system is McConks newest paddle and aims to solve the problem of needing more than one paddle for different SUP disciplines. 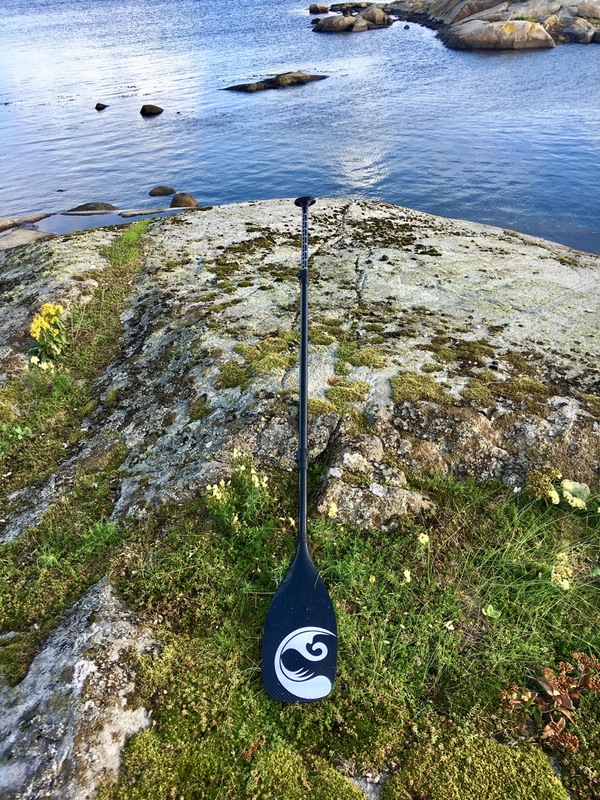 The switchblade system allows paddlers to use different blades with the same shaft and handle. It’s available with a carbon or glass fibre handle/ shaft combination and a variety of blades, details of those can be found here. Each blade is available to purchase separately allowing paddlers to minimise cost and maximise their paddle selection for different paddle disciplines, carbon for a long paddle in the morning then swapping the blade and lending it to your ham fisted friend who can only be trusted with a nylon blade! 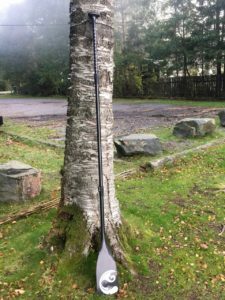 The switchblade paddle I have is carbon and comprises a carbon handle, carbon shaft and two switchable carbon blades; the 81 and 90 square inch race blades. In the garage I have a variety of paddles with different shape blades and sizes ranging from 83 square inches to 91, my go-to paddle is a 91 square inch blade in a teardrop shape. Construction Carbon Fiber blade, shaft and handle. I am a bit of a carbon fan and appreciate a nicely finished bit of the black fabric. The handle does not disappoint, a very comfortable shape in the palm finished with a high gloss top coat. There is guide line down the centre of the shaft with some height markings, all under the lacquer so they’ll not get scratched off. The carbon shaft was also finished off perfectly, the same plastic cam lock that I liked on the pervious version has been retained. The clamp is nice and wide which spreads the clamping stresses and has a small arrow indicator to help line the handle up. At the other end of the shaft is a 100mm long section that slides into the blade section. The blades have the same two bolt cam lock that is used to secure the handle. Both blades were a very snug fit to the shaft with no play at all when in place. However with no visual aid to line up the shaft to the blade which makes the guide line / arrow on the handle and upper clamp a little redundant. I was impressed with the original version of this travel paddle, this version is an improvement and although the lower clamp is not as sleek as the simple spring lock it replaced this is, I feel a better solution for long term use, if any play develops between the blade and the shaft it can be dealt with by nipping up the bolts a fraction. The clamp is also mounted far enough away from the blade that in normal use it won’t touch the rail of the board. The two blades I have are different lengths; the smaller 81 inch somewhat longer than it’s bigger brother. This is down to the blade shape with the 81 having a more slender neck which means that the the minimum and maximum length of the paddle will vary depending on the blade being used at the time. That in turn means that the height markings on the handle are only an approximation rather than an accurate guide. With a week of windy conditions and an impatient paddler the Switchblade first got wet on a horrible day, steady 19km/h wind gusting to 42 km/h, if ‘Windy’ the app is to be believed. The sort of day where you worry about the board blowing off the roof of the van (it didn’t) and you chose a smaller blade (I did), the 81 square inch was the first blade to get wet. I started with an easy 2.5km wind assisted paddle because that’s the only way from my nearest launch site and a head down and get on with it return. The 81 has a “scooped V double dihedral”. Dihedral is used to describe the angle between two planes, for a paddle the term is used to describe the angular shaping on the back or power side of the blade that controls the way the blade interacts with the water during the stroke. The aim is to reduce or eliminate flutter during the power part of the stroke and improve the feel of the paddle in the water and this seems to work. No matter how I paddled the blade behaved impeccably. Engagement at the start of the stroke is good, the blade stays stable during the power phase and the release is lightening fast. Impossible to measure and partly (mostly?) down to the small size the release at the end of the stroke is noticeably faster than any other paddle I have. Stroke rate was higher than my usual 40 / 42 with an average of 44. It felt good despite being the smallest SUP blade I’ve paddled with by a whole 2 square inches! It is a very vocal blade. If you have a good technique where you drive the blade into the water at the start of the stroke and keep it fully submerged through the power phase of the stroke then this blade is silent. If however you have a poor technique or are just bimbling along chatting to your mates with the blade near the surface you’ll hear it reminding you that this is called a ‘race’ blade for a reason and you should really get on with it. Next up was the big blade, at 90 square inches a size I’m more accustomed to albeit with a different shape to most of the paddles in the garage. 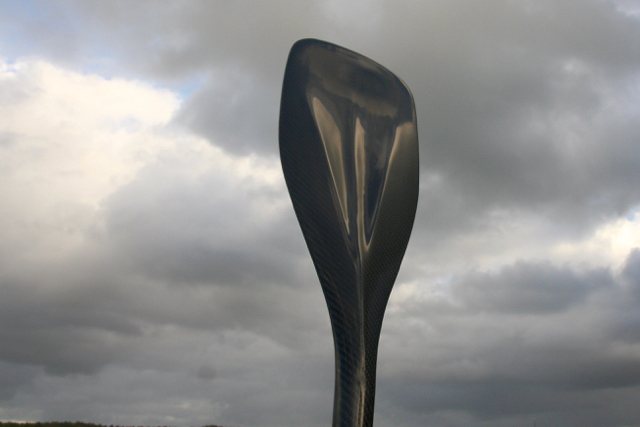 The 90 has a single dihedral (also referred to a spine) that runs down the centre of the rear of the blade. Again this is to direct water and reduce or eliminate flutter and it happens to add strength to the blade where it is most needed. 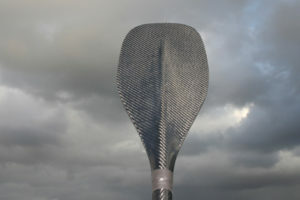 The blade is squared off in shape rather than a teardrop. 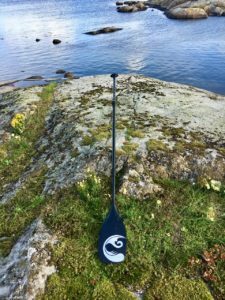 Typically a larger blade means a lower stroke rate which also reduces flutter and, like it’s smaller sibling this blade performed well on it’s first outing, a very windy coastal paddle, a series of upwind slogs between islands to get to the fun downwind return. My stroke rate was about what I’d expect in the conditions, average around 40. I can confirm that the 90 is excellent for ‘bracing’ with, where you lean hard on the paddle to keep yourself upright. Bigger paddles have their advantages! Whilst the performance of the blade was as expected I was impressed with the behaviour of the 3 part paddle in those conditions, no creaking, no fuss or excessive flexing. The only noticeable difference between this and my my first choice paddle being weight. Several weeks and more than a dozen paddles later the smaller blade has, surprisingly been used much more than the larger one. This is primarily because of the novelty of paddling with smaller blade which has lead to an increase in my cadence and a slight increase in average speed. A smaller blade is something I’m going to stick with and I’m very tempted to talk to McConks about a fixed length one. I am very impressed with the Switchblade paddle, it’s a cost effective way to have different blade sizes for different conditions and disciplines. As a three part paddle it’s stood up to a lot of use since I got it and it’s still just like new. The blade shapes work well and the fixings are of good quality, they should last for years if looked after. The paddle is supplied with a protective McConks bag will take the the handle, shaft and one blade. Each blade is supplied in it’s own protective cover.